FILE PHOTO: A yazidi boy passes destroyed houses in Sinjar region, Iraq August 2, 2017. 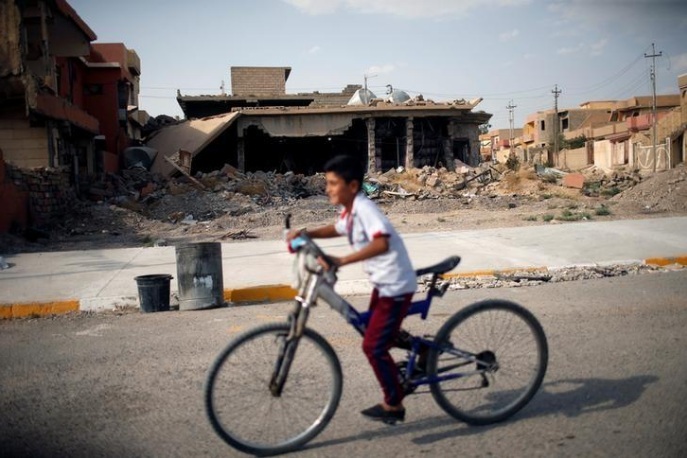 BAGHDAD - An Iraqi Yazidi group affiliated with a Shi‘ite-led armed faction took control on Tuesday of Sinjar, said residents of the northwestern city that is claimed by both Kurdish and central Iraqi authorities. The Yazidi group, called Lalesh, extended control over all of Sinjar after the withdrawal late on Monday of Kurdish Peshmerga fighters who were deployed there, the residents said. “There was no violence, the Lalesh group moved after the Peshmerga pulled out,” said a resident by phone. Responding to a Kurdish referendum on independence held last month, Iraqi government forces on Monday captured the Kurdish-held oil city of Kirkuk, transforming the country’s balance of power. That was part of lightning strike ordered by Minister Haider al-Abadi to retake all disputed areas, including Sinjar, occupied by the Kurdistan Regional Government’s Peshmerga force in the course of the war on Islamic State. Lalesh is affiliated with Popular Mobilisation, an armed group formed mainly of Iran-trained Shi‘ite paramilitaries, with the participation of smaller forces from other communities including Sunnis, Christians and Yazidis. It is officially under Abadi’s authority. An Iraqi Yazidi group affiliated with a Shi‘ite-led armed faction took control on Tuesday of Sinjar, said residents of the northwestern city that is claimed by both Kurdish and central Iraqi authorities.